The band Craniotomy was formed in 1998 by R. Halmo - guitar and L. Šiška - drums. A bit later, R. Váry / PYGO – vocals, joins the band. With this lineup, the band plays a few concerts and the 2nd guitar player P. Ondriš joins the band. In the summer of 2000 Craniotomy goes to studio to record their first demo containing 5 tracks, called …and from flesh to bone, which was later released as MC by Acne Prod. After this, guitarist Palo leaves the band and is replaced by P. Szemeneyi and bass player D.
Hanák / Shampoon joins the band. In the summer of 2001, the band records their second demo with 8 tracks in studio Exponent / Šulekovo /. A year later, in studio Moonset / Šala / 3 more tracks are recorded and added to the previous demo to be released by Grodhaisn Prod as a single CD called It…s Not Cut Out It Can…t Be Eaten. Releasing the CD, guitarist Peter leaves the band and Craniotomy plays a lot of concerts in Slovakia, Czech Republic and Germany. After some technical problems, the band records their CD called Cut A Piece For Your Hunger late in December 2004, again in studio Moonset, again under Grodhaisn Prod. 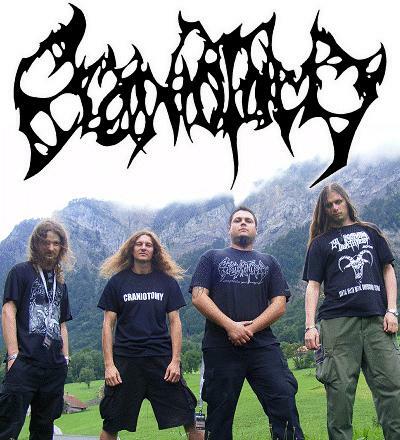 Craniotomy plays lots of concerts and fests in Europe with bands like Suffocation, Nile, Vader, Vomit Remnants, Belphegor, Grave, Necrophagist, Disgorge, Disavowed and more. In the beginning of 2008 the band leaves the label Grodhaisn and in July starts to record their third CD, again in studio Moonset, but this time with WWR – the former vocalist of Bloodcase4, who replaces PYGO. 10 Tracks are recorded with total length of 30:30 minutes and a new album is born called Catharsis. Currently, Craniotomy is looking for a new label to release this brutal death metal piece.